We’ve got some cool tools for all the do-it-yourselfers on your Christmas or birthday shopping lists, from hammers and saws to cordless screwdrivers and sharpeners. We even have tools and projects to keep the kids occupied! With prices from under $10 to over $100, you’re sure to find something for every DIYer on your list! If you’ve ever dropped a sock behind the clothes dryer or a ring down the drain, then you know what a valuable addition to your toolbox a mechanical retrieval tool can be. 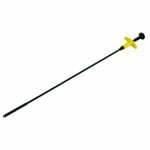 While these handy push button grabbers have been around for years, General Tools has added an LED light (batteries included) to the end of the 24” flexible shaft that puts an end to fumbling blindly in dark cracks and crevices. Under $10 at The Home Depot. The Spyder Scraper blade turns a reciprocating saw into a high-speed scraper that can remove dried caulk, adhesive, and mastic in no time flat. Simply insert the Spyder Scraper blade in a standard reciprocating saw, and let it rip. 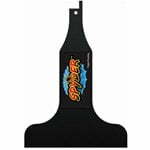 Spyder Scraper blades are available in 2”, 4”, and 6” widths. Under $10 (for 4” blade), go to spyderproducts.com to find a store near you. 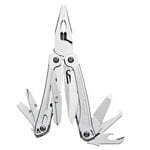 The Leatherman Wingman multi-tool puts an entire toolbox in your pocket. The Wingman makes the perfect accessory to keep in your car, boat, or bike for emergencies; or keep a Wingman in your pocket, so you’re always prepared. Tools on the Wingman include pliers, wire cutters, scissors, Phillips and slotted screwdrivers, file, bottle opener, can opener, and knife. For the younger DIYers on your list, check out the Red Toolbox line of tools and woodworking projects for kids. 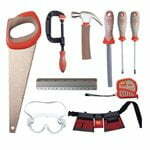 From individual tools – including clamps, hammers, saws, screwdrivers, and even a cordless drill – to 5 to 10 piece sets. The tools are designed to fit a child’s hands, as well as spur their imagination. Easy to assemble wooden projects for kids, ranging from birdhouses and boxes to display shelves and toys, are also available from Red Toolbox. Under $20, go to red-toolbox.com to find store locations near you. The Ryobi TEK4 cordless rechargeable screwdriver has an LED work light, two-speed gear box, 24 position clutch, and ¼” chuck to handle any screwing job from big to small. 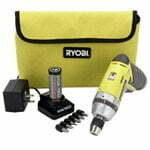 The Ryobi Screwdriver comes with a charger, bits, and removable lithium-ion battery, which recharges in an hour and is interchangeable with other Ryobi TEK4 tools. Screws provide much more holding power than nails, but visible screw heads can mar a deck’s appearance. The CAMO Hidden Deck Fastening System combines the best of both worlds, with a special drilling jig and screws to fasten wood or composite decking securely without unsightly screw heads. The DIY version of the CAMO Marksman requires reversing the jig to drill each side of the board while the CAMO Marksman Pro drills both sides without the need for repositioning. 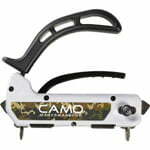 The CAMO Marksman is available at The Home Depot for under $20, and the CAMO Marksman Pro for under $50. With its unusual design and vibration absorbing handle, the MIG Weld Framing Hammer from DeWALT packs a bigger punch than its 15 oz. weight would suggest. 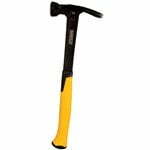 A built-in magnetic nail starter, checkered head, and rip claw nail puller make this hammer a real heavyweight contender when it comes to framing. Whether you’re a new homeowner starting a tool set from scratch, or a dedicated DIYer who needs an extra set of tools for your car or truck, this compact tool set from Husky is just the ticket. 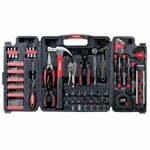 The set includes a hammer, pliers, adjustable wrench, socket set, screwdrivers, bits, level, tape measure, Allen wrenches, and more. It comes in a handy, compact, fitted, carrying case that measures 3″x14″x15″. The Ryobi Portable Flooring Saw is perfect for both ripping (up to 8”) and crosscutting (up to 11”) laminate and wood flooring, as well as molding and lumber up to 3/4” thick. The lightweight aluminum construction makes the saw easy to move and take with you on the job, and the dust collection system will help keep the job site clean. Under $150 at The Home Depot. 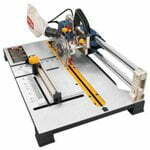 This motorized sharpening system can put a razor sharp edge on everything from chisels to plane blades to turning tools. 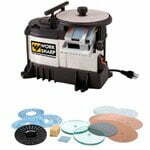 The Work Sharp uses adhesive-backed, abrasive disks that are applied to a tempered glass wheel, to sharpen without the need for water or oil. The abrasive disk on the top of the sharpener is used to flatten tools while beveled edges are ground from below with an adjustable angle guide. Watch our video to see the Work Sharp 3000 in action. Mr. Danny, in your opinion, what would be the mind blowing best ever tool you would love to get this Christmas?! Er, under $60.00 that is, and available too at a Home Depot so that I can get it without going online.